Michael Owen says he has regrets about spending last season at Manchester United before his release this summer. 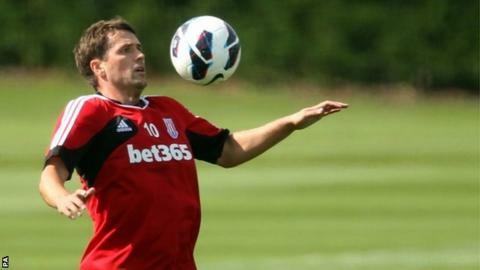 The former England forward, 32, is now with Stoke City after signing a one-year deal with the club last week. "In hindsight, probably with that extra year, it might have been better if I had moved in many ways," he said. "I was on the bench a lot of the time, but then when the manager says 'you have a big role to play and we want you to stay for another year', it was great to hear that from someone like Sir Alex Ferguson." He added: "I want to perform and I want to finish my career on a real high. I'm still only 32 and I still feel as if I have a lot left in me. "I've always scored goals, no matter what team I have been in, so as long as I can stay fit and healthy, then I'm sure I can do that here at Stoke." Owen was interviewed by Football Focus this week and asked if he felt he got the respect he deserved. "I wouldn't know what view people have of me," he said. "I don't really mind what type of view in many ways. "I think real football people appreciate what a good player I was and hopefully think I've still got a lot to offer. "Obviously I'm not 18 anymore and the fastest thing in the Premier League and a good finisher and everything else. "I'm still a decent finisher but I'm obviously not at the absolute peak of my powers. I was probably that at 19 or 20 but I still feel I've got a lot to offer. "Evidently Stoke do as well and evidently a few other Premier League teams did because they were a few teams I was in talks with." Watch the full interview with Michael Owen on Football Focus on Saturday, 15 September from 12:15 BST on BBC One.